Prashant Agrawal has been designated as India’s next High Commissioner to Namibia. He arrived in Windhoek on 16 November 2018 to take up the assignment. 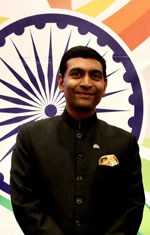 Prashant Agrawal joined the Indian Foreign Service in 1998. He has served in India’s Missions in Paris (2000-2003), Port Louis (2003-2006) and in Bangkok where he served as Deputy Chief of Mission and India’s Deputy Permanent Representative to UNESCAP (2009-2014). He served as India’s Consul General to Hong Kong SAR and Macau SAR (January 2014 till March 2016). He has also served in various capacities in the Ministry of External Affairs, New Delhi, handling matters pertaining to the US during 2006-07 and Nepal during 2008-09. He was a Senior Research Fellow at the United Service Institute of India working on “A comparative analysis of India and China’s approaches to Energy Security” during 2007-2008. He also speaks French. Prior to taking up assignment in Namibia, he served as Joint Secretary in Development Partnership Administration-I Division of Ministry of External Affairs, handling implementation of India’s entire portfolio of Lines of Credit (LoCs) to partner countries. Prashant Agrawal joined in Namibia with his spouse Rakhee and children Mrinalini and Ishaan.